My, my how time flies. I can hardly believe that it is the end of February already. That means that it is time for another 12 Kits of Christmas post. This month, Cathy Weber of Empty Nest Crafter is our hostess, and she sent us some really fun stuff. Polar Bears!! What is cuter than Polar Bears? (except owls....). And Snow Globes! I was beside myself with glee. I just love this polar bear in his snowy globe. On this next card, I used one of the extra Window die cuts that Renee sent last month. Fortunately, Renee sent quite a few extras. I used one of the recent Make it Monday techniques to make a snow globe shaker card with the fake snow Cathy sent. For this last card, I admit that I did get a bit nutty. I wanted to use that adorable felt polar bear, and also had quite a bit of paper left over. I used this week's Card Positioning Systems Sketch CPS-254 to guide my card design, and some googlie eyes and an eyeglass brad to give my bear some style. I think this gal is my favorite. She is totally cool, don't you think? This week, Dawn McVey shows us how to create large frames with smaller frame stamps in MIM#55. This is an easy and handy technique, and I can see using this often. 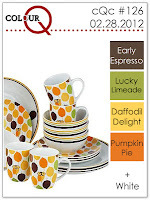 I used this week's ColourQ cQc#126 colors for my card. 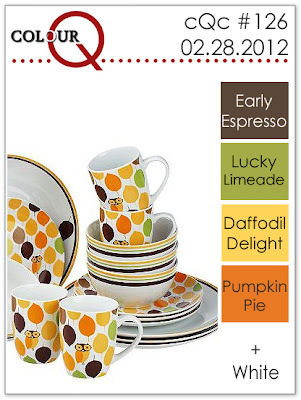 How cute are those dishes with the owl--I think I need those, too. I finally used some of my Flower Fusion stamps to make a card for my daughters to send to my mom, who has been in the hospital for much too long. She seems to perk up most when she is reading her mail, so I am trying to make sure she gets lots of it. This card is a CASE of a card I got quite a while ago from my friend Kim from Cupcakes, Cards and Kim. I'm not sure if she ever posted it--I CASED from the original, sitting here on my desk. First, I'd like to thank JJ Bolton of Ribbon Girls who first gave me this honor. I was so surprised and pleased when I heard this. JJ is a super sweet and talented crafter, and I have practically worn out my "Pin it" button while viewing her blog. Next, I heard from Jen W. of JENerally Speaking, who passed the award on to me as well. 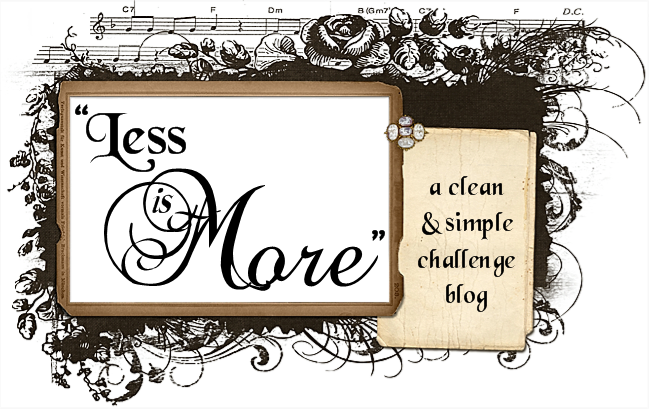 I have only been following Jen for a short time, but I have found so much inspiration on her blog. I look forward to getting to know Jen better and to seeing more of her creations. Thanks, Jen, for thinking of me. Then, this morning, my dear friend Renee of Its a Patchwork Life honored me again. Thank you, Renee. I am in several blogging groups with Renee, and she has become a good friend as well. She has the incredible ability to create a stunning CAS card with 3 elements one day, and then the next day, something so elaborate, I could look at it for a week and still not see everything. My daughter recently made a little something to give to a friend for her birthday. Of course, we had to package it with a loopsy daisy bow and a glitter button, using this week's MIM #54 technique. I don't know that I'll ever use another button without glitter again! I found this recipe when I was reading Mara's blog, Love Your Mother. She posted pictures and a link to a recipe for Chocolate Chip Caramel Cookie Bars that had me rushing into the kitchen. My 12 year old daughter was able to make these pretty much on her own, and they are as delicious as they look. Click here for better pictures on Mara's blog, and here for the recipe at Two Peas & Their Pod. Well, this was a pretty long post. If you've gotten to the end, I owe you a Chocolate Chip Caramel Cookie Bar next time I see you. 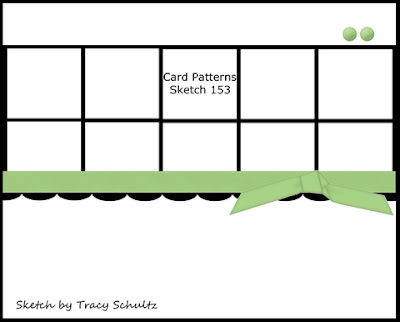 This month's Papertrey blog hop is all about interactive cards. I was lucky enough to get my February order in time to break into my goodies and use them on a card. I made a birthday card for my daughter's good friend, and used three interactive elements. I used Its a Jungle stamp set and die to create my spinning creature. My daughter wanted a tiger, rather than a cheetah, so she drew in some stripes. I used the curved die from Spinners to create the track, and the straight die for my sentiment. My second interactive feature is the glow in the dark embossing powder I used to emboss those harvest berries branches that make up this tiger's jungle. For my third interactive feature, I put a message inside the card, using the zipper dies and Movers and Shakers sentiments. Today a few friends and I are hosting a mini blog hop, spotlighting two Papertrey stamp sets: Garden Variety and Year of Flowers Mini. Turns out we all had one or both of these sets, and they weren't seeing as much love as we expected when we bought them. Or, in my case, no love at all. So, we all agreed to pull these sets out, play around with them, and all post on the same day. I started out how I normally start with a new or challenging stamp set. I find an expert and CASE! This next card was inspired by this card by Dawn McVey and is also my submission for this weeks CR84FN84 challenge to use Chartreuse, Gray and Lavender. After CASE-ing three cards, I felt like I could fly solo, and created the following two cards. Lucky for me, my daughter was around, so she colored the flowers on these cards with Copics. I'm eager to see what my friends have created with these sets. I must say that I was going to put them up for sale if I couldn't come up with any good ideas after really trying to use these sets. I am happy to report that I think I'll keep them. 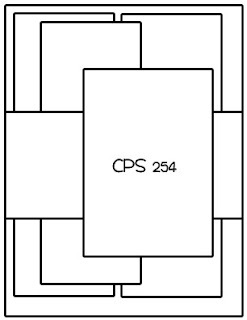 And, after I see what the others have created, I will probably have even more ideas about how to use these sets. Please hop on over to these blogs, and see what they have done with Year of Flowers Mini and Garden Variety. And, if you have either of these sets, and want to join in the fun, please do so. Just post a card, and let us know in the comments, so we can come visit you. I have some exciting news to announce: I am a Paper Doll!!! I have been asked to join a really fabulous group of women paper crafters, and I am just so thrilled and honored to be a part of their group. 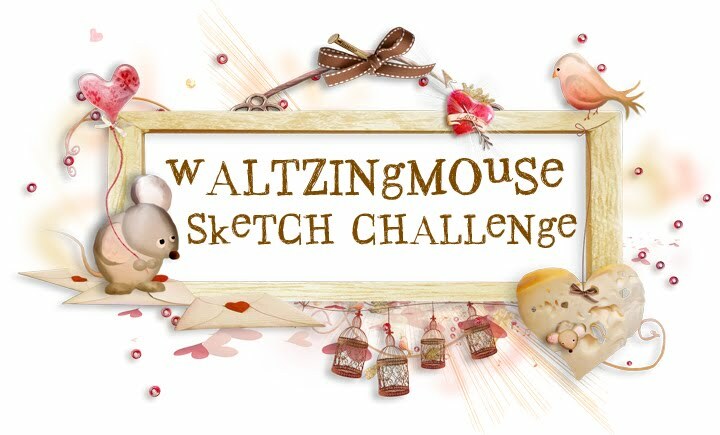 We will be hosting challenges starting in March, and I don't know what else, but I am ready and willing. You can see the other members of this group on my new sidebar to the left. Click here to go to our Paper Dolls website. 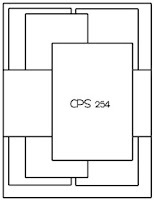 I have a card for this week's One Layer Wednesday OLW80 which is to use two colors, two images, and masking. Sentiments are optional but must be in one of the two colors, just to make the whole thing more diabolical, um, challenging. (Susan's words, not mine). I found the challenge fun and interesting. I may try to do some more if I have time. 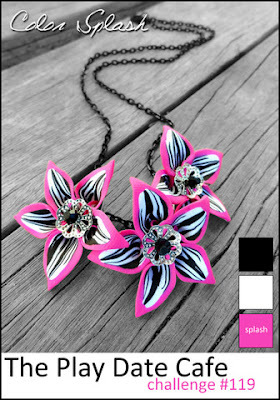 I've got a quick card for this week's Play Date Cafe PDCC119, black, white and a splash of hot pink. I think I am getting this card in almost at the last possible moment, but better late than never. I used Hero Arts Dictionary Greetings, and then highlighted parts with a hot pink highlighter pen. The quotes were cut with Papertrey numbers dies, which also come with lots of symbols, too. A bit of hot pink twine from the Twinery finishes off this simple card. I'm back with another card for this week's Make it Monday #54: Glitter Buttons. This time I used several buttons I made myself using these flower and these button molds and polymer clay. I used stickles Diamond to add the glitter. 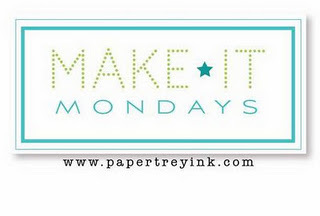 I'm also playing along with this week's Papertrey Make it Monday #54: Glitter Buttons. 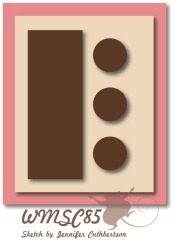 I really wanted to use one of the Memory Box window dies Renee sent to me, and was inspired by this card by Kara. I had spray adhesive at home, so I used that technique. 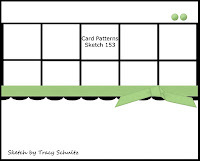 I got a brand new die in the mail today, and when I saw that die and this card by my friend Cathy, I knew I needed to play along with this week's Card Patterns Sketch #153. I've never played with Card Patterns Sketches before, but today seemed as good a day as any to start. 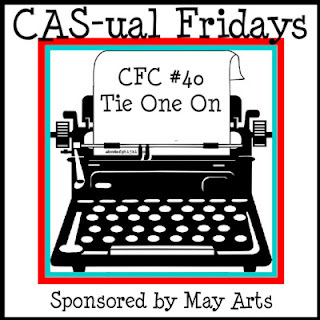 I'm also playing along with this week's Less is More Challenge #55 to use punches or die cuts, and this week's CAS-ual Friday's CFC#40: Tie one On. The other 'Joyce' on the PTI forum has suggested that we take a moment today to honor Nicole, Jenn and all the other folks behind the scenes at Papertrey. This card is dedicated them, as they are responsible for every single element on this card except the die cut. Now that I am thinking about it, I probably should have made this a 'thank you' card. Oh, well--they all have birthdays, too--right?